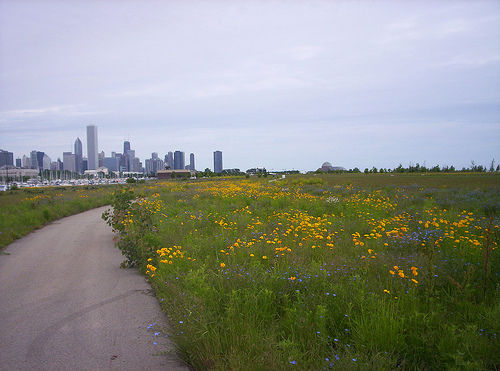 The Chicago Parks District is holding a public meeting on the future of Northerly Island tonight at the Spertus Institute from 6-9pm. The 91-acre peninsula, which is connected to the lakefront by a causeway, has played an important and evolving role in Chicago's civic imagination. It figures prominently in the Burnham Plan, was home to 1933-1934 World's Fair, and later the Meigs Field airport, and was part of the 2016 Olympic bid. The meeting will offer a preview of plans for the island and solicit public comment. Friend of AN Jeremiah Joseph visited an exhibition of interest in New York's gallery district. Et in Arcadia Ego, a new exhibition at the Thornton Room in Chelsea, examines the intersection and overlap of natural and man-made landscapes. With the title, roughly translated from Latin, “I am in pastoral utopia,” the show, curated by Blanca de la Torre and Juanli Carrion, could easily devolve into a Nature equals Good, City equals Bad equation. Instead, the way the six artists explore the topic is not so divisive or stale. The work tends to engage the subject from the side, generating surreal results. At the end any answers are farther off than before viewing the work, and this ambiguity is show’s strength. It prevents the viewer from standing too sure-footed and jumping ahead to conclusions and prejudices. In the modest gallery space, Chus Garcia-Fraile 's video Protected Zone is projected in the front window. In the piece, an escalator is placed in a lush forest, running like a waterfall in reverse. The device sits seamlessly in the forest. The viewer knows these components should not co-exist, save perhaps in some Wow-Me mall in Dubai where ski-slopes and the world's largest-something-or-other are commonplace. But here the relationship is eerily correct. 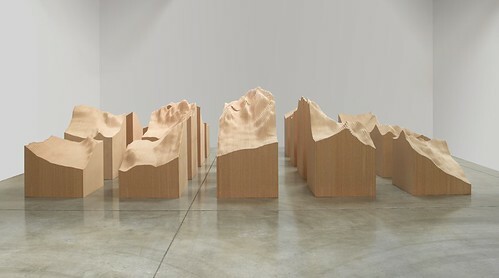 Recalling the tension of Michael Heizer's Double Negative—platonic geometry thrust into a rustic landscape—two clearly opposing conditions go deep into dialogue (or not) with each other, forcing us to decide which reading is correct—nature, man-made, or a combination. Carlos Irijalba's video Twilight uses artificial light as a gateway into natural and synthetic landscapes. The video begins with the viewer above an empty soccer stadium where an array of stadium klieg lights flicker on as twilight arrives. With gentle thrumming of the city beyond, the lights run through varying colors until they hit their hottest white light. Dropping down and hovering above the perfectly manicured grass pitch, the light and flora are shown in their most synthetic and controlled states. Relocating to a forest at twilight, a generator rumbles on and the same array of lights reveals a very different context. Standing like the Monolith from Arthur C. Clarke's 2001: A Space Odyssey the lights are clearly alien among the trees and insects. What does the light Monolith bring to the forest? Simple illumination? Does it turn the forest into an overly dramatic movie setting or bring an impending sense of destruction? Or perhaps a sense of detached and bemused sentimentality? With a different sensibility, the photographic works Catastrophes by Christoph Draeger recall newspaper disaster images. With child-like earnestness, the images show the apparent aftermath of a plant explosion and a tornado strike. The cheekily morbid images, familiar at first glance, quickly reveal they are deliberate constructed narratives. Both pieces in fact are careful staged and photographed models. The fabricated horrors are so thoroughly executed it is difficult to suppress a smile at their morbid nature. But this inversion of bleak sadness leads to a pause. How often do we gloss over these situations in the media with a mild sense of loss, but a greater sense of relief because they are far away? Draeger directly engages the terror, readdressing them as modern fables and foibles. We look at the images as a whole and then trace through to see how they are made. In the deep scanning and study we see fresh the nature and complexities of real world catastrophes. By far the most architectural and accessible but also most troubling piece is J.G. Zimmerman's Dystopia Series: Suburbia (above). 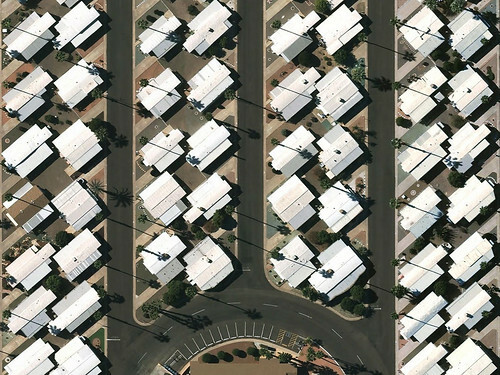 In a 24 minute video satellite images of suburbs run by leisurely, hypnotizing as the landscape morphs from one familiar suburban fabric into the next. Initially appearing like a lazy Google Earth, the video is actually a deftly crafted piece of art. 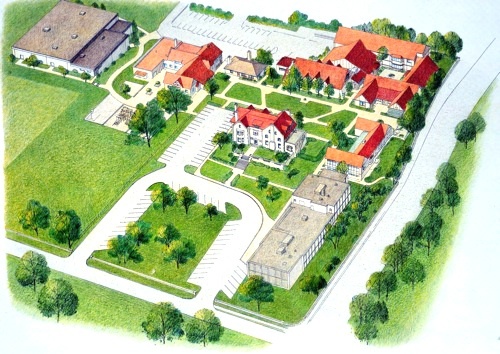 By specifically removing details and cues of inhabitation—there are no cars or people—we are left only with houses, streets and a smattering of grass and trees. It would too easy to jump to the conclusion that a suburban existence equals the Boring Life, but the artist sidesteps this reactionary reading. Recalling photos by Hilla and Bernd Becher studying industrial archetypes Zimmerman bends our perception of reality. Even while carpet-bombing the landscape with familiar suburban quadrants, we see an odd duality of sameness and differences everywhere. The effect is spellbinding and disturbing leaving us wondering what is real and what is simulacra – in both the video and real-life. Rob Carter's Landscaping II is a large-scale print of plants growing literally up and through folded, cutout images of traditional buildings. A recurring theme for Carter, nature reclaiming urban territory, in the piece he places two different scales together (real life plants within the tiny pictures of historic buildings) and allows the intermingling to commence. There is no good or bad, winner or loser, only a snap shot of a process. Shot strongly in black and white and printed large scale, the picture is harder to decipher then if it was shown in color and in 1:1 scale. Carter obscures legibility, creating a situation where he and the audience are both first time viewers of this creation. Everyone, artist and viewer, have wait for allow the process to unfold. And all we can do is to try to understand the equilibrium, if there is one, and ponder where the process might lead us next. Et in Arcadia Ego runs through May 23rd at the Thornton Room, 150 West 25th Street, New York City.